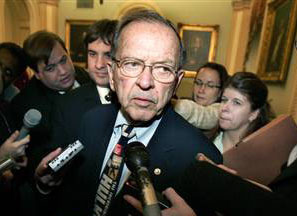 The Justice Department filed court papers this morning asking a federal judge to toss out the conviction of former senator Ted Stevens (R–Alaska) on corruption charges. It’s a shame that Stevens is getting off, since the evidence very strongly suggests that he was guilty. But misconduct by federal prosecutors is far too widespread, and it stays that way because it’s almost never punished by anything more than a tonguelashing. Good for Holder for sending a message that he takes it more seriously than that.